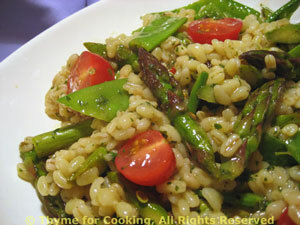 Spring Barley Pilaf, with asparagus and mangetout, Thyme for Cooking side dish. Chewy barley makes great pilaf and salad. It has a bit more substance than rice and is a nice alternative from pasta. This is meant to be served warm or room temperature. Cook barley in stock until done, stirring occasionally. If all stock is not absorbed, drain. Trim mangetout and slice into thirds. Trim asparagus and cut into 1" (2.5cm) lengths. Bring a medium pan of water to boil and blanch the asparagus for 2 minutes if slender, 3 minutes if thick. Add the mangetout for the last 1 minute of cooking time. Drain and rinse with cold water to stop the cooking, but leave them a bit warm. In a small bowl whisk together mustard, Herbes and vinegar. Put barley into a medium bowl. Add drained vegetables, chives and Vinaigrette, stir well to combine. Add tomatoes, stir gently and serve.